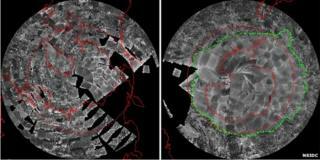 The earliest satellite maps of Arctic and Antarctic sea-ice have been assembled by scientists. They were made using data from Nasa's Nimbus-1 spacecraft, which was launched in 1964 to test new technologies for imaging weather systems from orbit. The satellite's old pictures have now been re-analysed to determine the extent of the marine ice at the poles in the September of that year. Regular mapping from space did not begin until 1978. One key finding is that marine floes around the White Continent in the 1960s were probably just as extensive as they are today. The new snapshot, published in The Cryosphere journal, therefore helps put current ice conditions into a longer-term context, say researchers at the US National Snow and Ice Data Centre (NSIDC). It is also just a fascinating story of how old scientific data can be given a new lease of life. The Nimbus-1 satellite was a short-lived mission that observed the Earth's clouds in black and white video, which it transmitted to the ground as an analogue TV signal. Those transmissions were then photographed on to 35mm film and archived. The NSIDC team had to pull the canisters containing the original film out of storage to perform the re-analysis. "The canisters were kind of forgotten, almost lost in time, until about four years ago when they were found and it was realised they might contain some useful, interesting data," explained the NSIDC's Dr Walt Meier. "We then got some funding to digitise the data and analyse it. I was sceptical at first; the quality of the data is nothing like what we can get now. "But it turned out to be really good, especially in the Antarctic, where it was surprisingly easy to determine the ice edge. Don't get me wrong, it was certainly a challenge," he told BBC News. "One of the things you have to do is geo-locate the data - you have to know where you are looking. There was some information in there to help us, but we had to take care in matching up the images and locating them on the Earth as accurately as we could." Although the satellite worked for just three weeks, it covered a period of key interest to polar scientists. September is about the time when Arctic sea-ice cover tends to reach its minimum area in the northern summer melt; and when the Antarctic floes achieve their greatest reach because of the southern winter freeze-up. The NSIDC team had to review hundreds of metres of film to find cloud-free views that would allow them to discern the edges of the sea-ice over this period. Scientists on the project caution that the Nimbus-1 data represents just three weeks in one year but nonetheless underscores some interesting observations. The research shows, for example, that sea-ice extent in the Antarctic in 1964 reached at least 19.7 million sq km. That is greater than anything seen in the continuous 1979-2012 data-set - larger even than the "record" extent of 19.44 million sq km achieved last year. This certainly fits with anecdotal evidence that sea-ice in the southern polar region in the 1960s was very broad. And it gives scientists something to ponder as they try to explain the recent year-on-year growth in winter ice cover recorded in the Antarctic. "Ships would go down in the 1960s and, of course, they would only see small parts of the Antarctic, but anecdotally it seems like there was more ice back then, and this research appears to confirm that," said Dr Meier. "We've seen since 1979 some small increasing trends in the Antarctic with a lot of variation from year to year. So the question is: have we been seeing a real shift or something more cyclical? Nineteen-sixty-four gives us some indication that what we are seeing now may actually be within the bounds of natural variability. "It certainly puts the 'record highs' for newer satellites in perspective. These are records since 1979, not necessarily before then." The reconstructed Antarctic map is more complete than the corresponding map for the Arctic where the team had to contend with more gaps in the Nimbus coverage, including around the Canadian Archipelago and north of Alaska. These holes were filled with contemporary ice chart data from ships, where available, and with more recent, long-term satellite data where nothing more suitable could be sourced from the time. The analysis produced a summer Arctic sea-ice minimum extent of 6.9 million sq km. This is broadly similar to the 1979-2000 average of 7.04 million sq km observed by modern satellites, and the number used to judge current behaviour in the Arctic. Recent years have witnessed a dramatic decline in both volume and extent, with the 2012 coverage - like the Southern Hemisphere - setting a "record" for the modern era at 3.41 million sq km. Today, US military weather satellites return daily data on the state of the sea-ice at both poles, but the NSIDC team is keen to retrieve as much information as possible from the early, experimental Nasa Earth-observers. Data from Nimbus-2 and -3, covering 1966 to 1972, is now being investigated. "Film canisters take up a lot of room and so there's a temptation to get rid of stuff like that. Now, it's all been digitised, and it's available for other researchers wanting to investigate other climate parameters, not just sea-ice," said Dr Meier. Dr Scott Hosking, who works with the British Antarctic Survey and was not connected with the NSIDC study, commented: "Expanding our sea-ice datasets is essential for understanding long-term variability in the polar regions. "The increase in Antarctic sea-ice extent in this one month snapshot agrees with ice-core-based reconstructions for the same period. "Processing more of this imagery would allow us to provide more robust conclusions about how recent sea-ice change compares with that of the pre-satellite measurement era," he told BBC News.